We are now offering two different "Sets of Songbooks" and a "Children's Book Package." We offer songbooks in a set of ten (10) or a set of twenty (20). 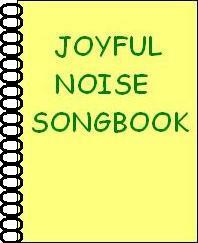 The Joyful Noise Songbook has a laminated cover and is a coil bound 5 1/2" X 8 1/2" songbook with 185 songs printed on heavy bright white paper. It costs about $4.00 apiece for materials to produce these books. Songbooks are sent via "Media Mail" and will arrive in 5 to 7 business days. *Our materials are produced and distributed for small home fellowship and individual personal use. Gladly cartoons may be reproduced for a small group (5-10) or home fellowship. They may not be copied for resale or distribution to large numbers of individuals, churches, schools or other organizations. The "Children's Book Package" cost $25 and contains one (1) set of 6 Gladly Bear books for a small home fellowship or individual personal use. The Gladly cartoons featured in these full color picture books are enlargements and adaptations of the monthly presentations that can be found on our web site in the Gladly Bear Cartoon Archive. 1. To receive materials from Cortright Fellowship Press send payment via paypal. Upon receipt of your request and payment we will get your materials in the mail ASAP. *Our materials are produced for individual personal use. Pages may be reproduced for a small group (5-10) or home fellowship. They may not be copied for resale or distribution to large numbers of individuals, churches, schools or other organizations. 2. If you do not want to use PayPal and would like sets of songbooks or the Children's Book Package you can request materials from Cortright Fellowship Press by sending a letter via postal mail along with a check or money order. When you fill out and mail the request form and a check or money order to us, we will send you the materials you have requested.